The SUV market is getting crowded, fast, and carmakers are scrambling to have their own models stand out. At first glance, Volvo’s new 2019 XC40 might not fit the bill, both figuratively and literally. Its smallest SUV, the subcompact looks like a seriously shrunken version of the company’s larger XC60 and XC90. Yet the XC40 is looking to prompt a shake-up much bigger than its footprint, with a new platform under the sheet metal and a new way of adding one to your garage. I got a chance to take the new XC40 for a spin, to see if it has what it takes to stand tall among larger vehicles in its segment. More for less seems to be the general theme of the 2019 Volvo XC40, both inside and out. While it borrows the design of its larger cousins, Volvo’s smallest SUV is actually very different under that skin. It’s the first to use the so-called Compact Modular Architecture, a new platform co-developed by Volvo and Geely to not only package cabin space and safety, but accommodate a variety of powertrain types as the Swedes move further and further toward full electrification. The flourishes that tell you it’s a modern Volvo are all present and correct. The “hockey stick” lamps on the rear, combined with a larger than usual C-pillar, give the XC40 the illusion of extra space from the rear three-quarter angle. Inside, meanwhile, space is actually no illusion, and room has been found for more cubby holes, drawers, fold-out bag hooks, USB and wireless charging, and even a removable trash bin. Volvo’s vertically-oriented touch screen, the 9-inch SENSUS system, dominates the dashboard. Outside, the bi-color design gives the SUV some character, if that is you want it. The black roof is standard, but a contrasting white version is available as an option on the Momentum trim. The range kicks off in dealerships with the T5 Momentum all-wheel drive, with a 2.0-liter inline-four turbocharged engine good for 248 horsepower and 258 lb-ft. of torque. A front-wheel-drive T4 Momentum should follow later with a smaller engine and a matching lower 184 hp output, which I didn’t get to test since it won’t be available at launch. A T5 AWD R-Design option includes Sensus Navigation Pro as standard – optional on the Momentum trims – along with keyless entry and hands-free tailgate opening, a slightly different grille, and metallic exhaust tips, among other visual tweaks. Behind the wheel, I discovered that the XC40 has something of a split personality. It’s an SUV and, at the same time, doesn’t always feel like one. On the road, it drives smoothly, turns sharply, and steers lightly. The performance doesn’t stand out as much as its appearance does, and the compact dimensions make it perfect for the urban use that Volvo is targeting. It easily navigates city roads and can quickly swerve to avoid the occasional car stopping so suddenly or the pedestrian popping out from nowhere. The XC40 was built for the city, and its performance there proves it. While the steering is on the light side normally, the XC40 offers several drive modes with the possibility of weighting that up some. The suspension does a decent job of smoothing out bumps, but it could be better. Smaller and thicker wheels, like those on the Momentum trim, could help solve that, even if they don’t look so slick. The cabin does a good enough job of isolating engine noise, but the sound that does get through isn’t particularly attractive. This is not an SUV that’s built to purr or roar. On the other hand, it is built for space. Two cupholders for the front? Check. Smartphone compartment in the center console? Check. Storage compartment under the central armrest? Check. 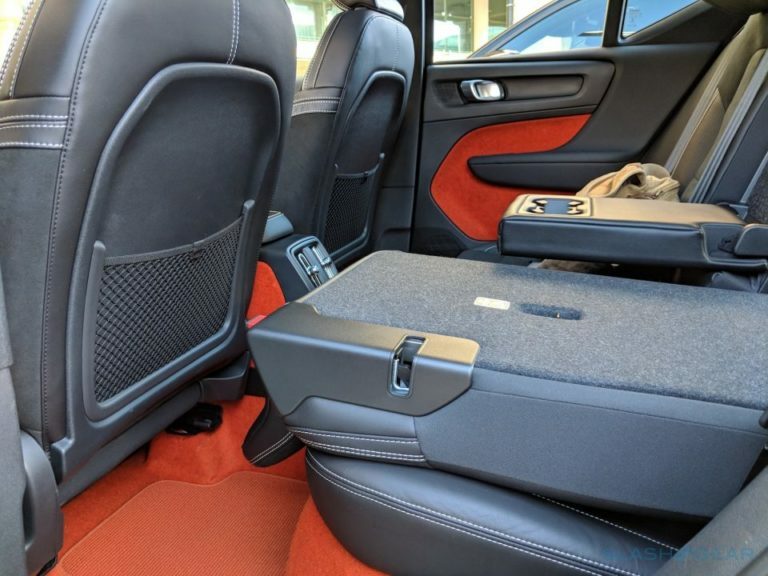 Drawer under the front seat, bag hooks, a removable trash bin, a front door pocket big enough for a 15-inch laptop, and a cargo capacity of 20.7 cubic feet? I’ve run out of check marks but Volvo’s cabin designers are still going. In short, it has all the space that young urban travelers require. And that’s precisely the type of customer that the XC40 was created for. Volvo is gambling its subcompact SUV future on a younger generation of buyers whose lives are more or less concentrated in cities. Need a more traditional, more spacious, and more powerful SUV? The XC60 and XC90 have you covered. Want a spunky, almost cheeky subcompact that gets you from point A to point B without much fuss but with almost all the comforts of space inside, not to mention the amenities of what the most recent automotive technologies have to offer? The XC40 may be what you’ve been looking for all this time. As for those technologies, Volvo has always been proud of its safety features. 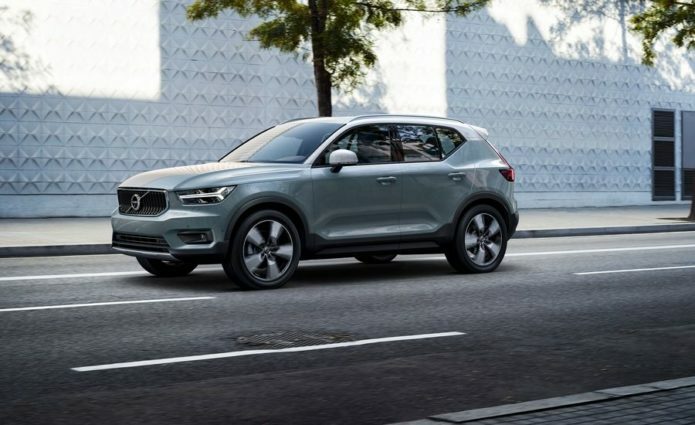 Standard on all trims is City Safety, again pointing to the XC40’s urban calling. This particular feature hits the brakes when it detects that collision is imminent. Lane assist, driver alert control, collision avoidance, and a whole lot more make up Volvo’s Technological Package. But perhaps the most interesting, as well as most controversial, tech feature you’ll find in the XC40 is its “digital key”. It enables car sharing by simply sending someone a code to unlock and drive the car without a key, even when you’re half a world away. Of course, you can remotely track where your car has been, how far it has driven, and how much fuel it consumed. It’s the ultimate car-sharing convenience (and hopefully not a security nightmare waiting to happen). Volvo’s focus on a younger, newer generation of buyers is perhaps best reflected in its unorthodox method of selling the 2019 XC40. Pricing starts at $33,200 and ramps all the way up to $37,700, before you start checking off the options. However, the automaker isn’t counting solely on finance or leasing. Instead, there’s what Volvo calls “Care by Volvo,” taking a page from the smartphone market’s book in changing the way you can “buy” a car without actually buying one. Some a carrier, you pay a monthly fee in exchange for not having to worry about variables like a downpayment, taxes, services, and other factors related to location or even your age. $600 per month for a well-equipped XC40, including insurance, 15k miles driving allowance a year, and even wear-and-tear items like wiper blades and brake replacements. After 12 months, US customers can sign up for a new, 24-month agreement and get a new car, though those in Europe have to wait the full 24 months. Alternatively, if you get to the end of the two years you’ll have the option to buy the car outright. While with some careful shopping around you could probably piece together everything Care by Volvo offers for less than $600 a month, the value is clearly in just how convenient the scheme is. Looking ahead, Volvo will build on the scheme with other features, like its in-car delivery service that allows couriers to drop deliveries into the trunk wherever you’re parked. As all-electric vehicles start to play a bigger part of the Volvo – and performance sibling Polestar – line-up, we’ll see features like being able to borrow traditional gas cars for road-trips where you might not be able to guarantee charger access. It leaves the 2019 XC40 as more than just a great little SUV. Volvo’s approach to shaking up ownership isn’t just an attempt to lure in car-shy Millennials, but could grow to accelerate the adoption of electrification among mass-market drivers who right now are turned off by range-anxiety. Exactly how that might pan out – and whether drivers will embrace it – we’ll see in 2019 when Volvo’s first all-electric car is set to launch (and then be followed by an all-electric XC40). For now, though, there’s plenty to love about the 2019 Volvo XC40. Distinctively designed, packed with technology and thoughtful cabin features, and easy to drive, it’s a playful alternative to cars like Audi’s Q3 and BMW’s X1, not to mention very reasonably priced. Even if you don’t care about Care by Volvo, that’s reason enough to include it on your compact luxury SUV shortlist.